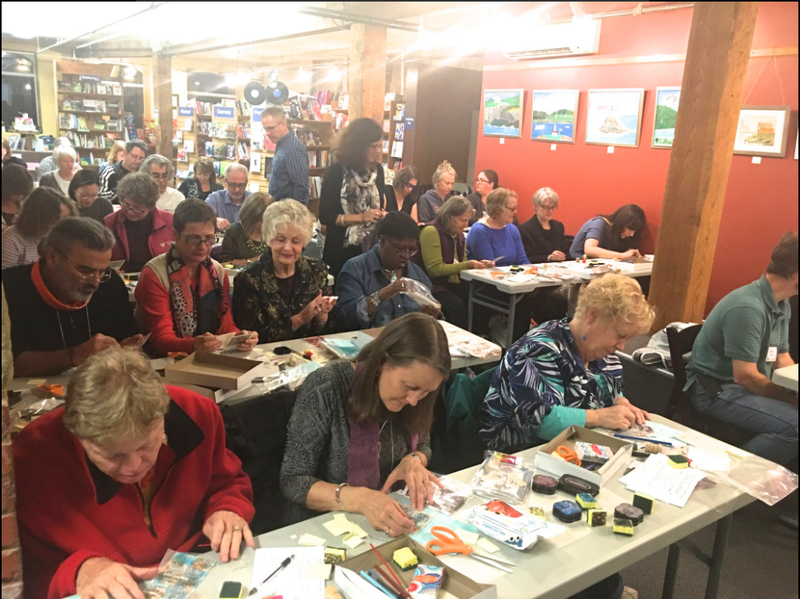 Two weeks ago, I had the awesome opportunity to lead a Found Poem Makerspace Workshop in Bellingham, Washington, the night before Western Washington University’s inaugural Poetry CHaT POETRY CAMP for grown-ups! Nearly 40 children’s poets, each of us published in The Poetry Friday Anthology series by Pomelo Books, came from all over the country and a couple of other countries as well to participate. The conference concluded with a special performance by Jack Prelutsky, who received a surprise award from the University. The whole weekend was an absolute blast. It was also an amazing feat, organized by WWU’s Sylvia Tag and Nancy Johnson, with poet organization by Pomelo Books’s Sylvia Vardell and Janet Wong. 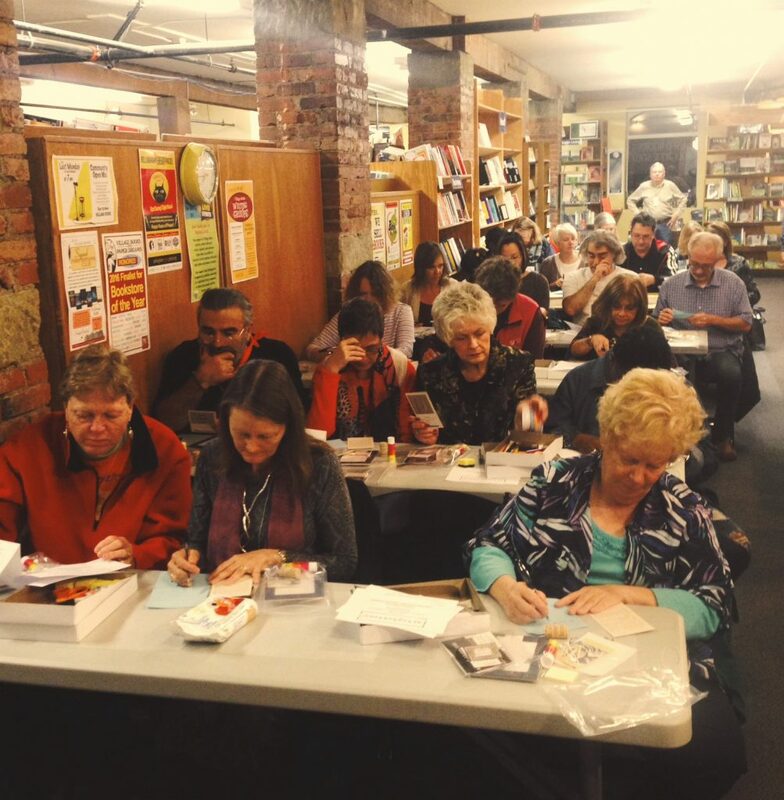 I was delighted to be asked to present an art workshop at the incredible Village Books on Friday night. It was open to all the poets, plus any bookstore customers who wanted to join in. What a band of creative souls we had! 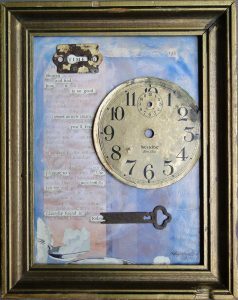 Janet had asked if I could lead everyone to make something akin to the mixed media found poem pieces I offer in my artsyletters shop on Etsy. “Of course!” I said, and then started planning like crazy. I knew I had to adapt the process, as my pieces take lots of overnight drying time between the various elements, plus I use a lot of messy materials. I needed to come up with something we could create in an hour, and I still wanted to use authentic vintage “ingredients.” And I needed to assemble supplies for – *cough* – up to 50 participants! I sent two heavy boxes of materials to Bellingham a week beforehand, and the lovely Fairhaven Village Inn had them waiting in our room when we arrived. Many thanks to my hubby, Jeff, who helped me assemble 50 “kits” and 25 boxes of supplies! He also ran errands, helped avert a Powerpoint techno-disaster by retrieving Janet’s computer when mine wouldn’t work with the cord, and helped set up additional tables at the venue. 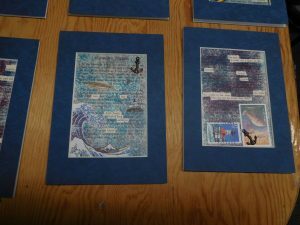 Serving as both substrate (surface) AND text, these cards worked great, with their text box fitting EXACTLY inside the pre-cut mats I ordered in a seafaring blue color. We wanted to celebrate Bellingham’s seaside location in the Pacific Northwest, and since I was coming all the way from the “Atlantic Southeast,” I was happy to incorporate an ocean-friendly theme. 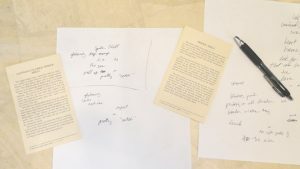 I demonstrated how to find a poem in a text that wasn’t intended to be poetry, as I’d done with two poems in Georgia Heard’s THE ARROW FINDS ITS MARK. For this project, however, we used more of a “blackout” approach like I do in my collages. Participants jotted down poem ideas on paper, and when they were satisfied, snipped tiny strips from the sticky margins of sticky notes to cover the words they wanted to keep as a poem. 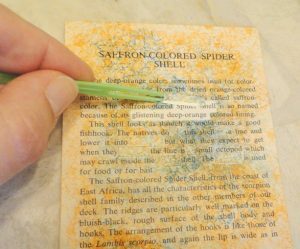 Instead of layers and glazes of acrylic or gouache paint, as I use, I provided a variety of colors of Stazon® ink pads. This ink dries very quickly. 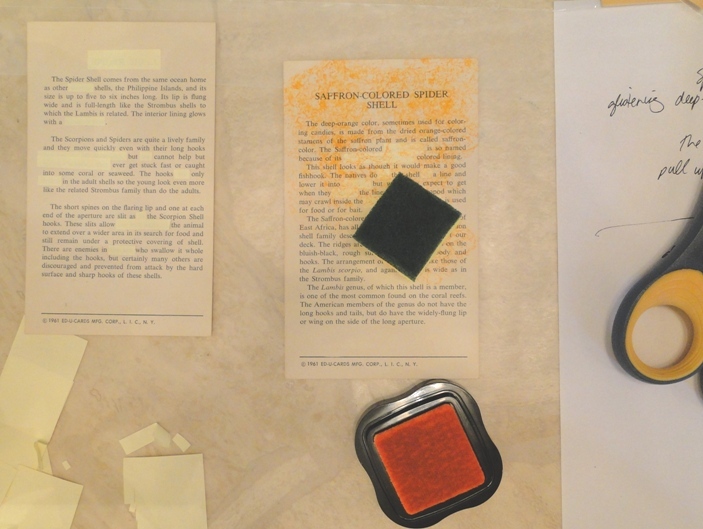 Each poet-artist dabbed a color or two or more over the card (& over the sticky note strips), to cover the surrounding text. I’d provided cut-up sponge pieces, brushes, cotton swabs and the like. Signo gel pens in different colors, and colored pencils, were also included, for making shadows under the chosen words, embellishing, or other touches. The sticky note strips were then carefully peeled off with plastic toothpicks or tweezers, revealing the found poem. Then it was “ephemera” time. 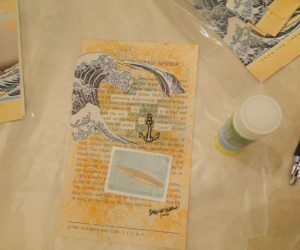 In each packet I included vintage bookplates and sea-themed postage stamps from around the world. (All found on Etsy. 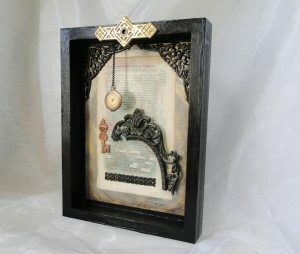 I love Etsy as a shopper as well as a seller!) 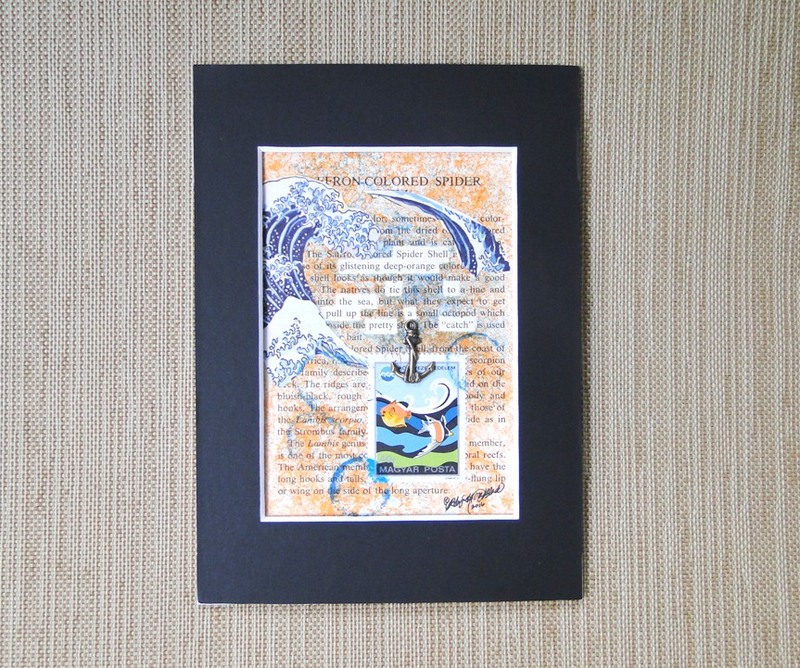 Many of the bookplates featured Katsushika Hokusai’s “The Great Wave” image, a woodblock print from the 1830s. Stamps included nautical images of boats, fish, or lighthouses. 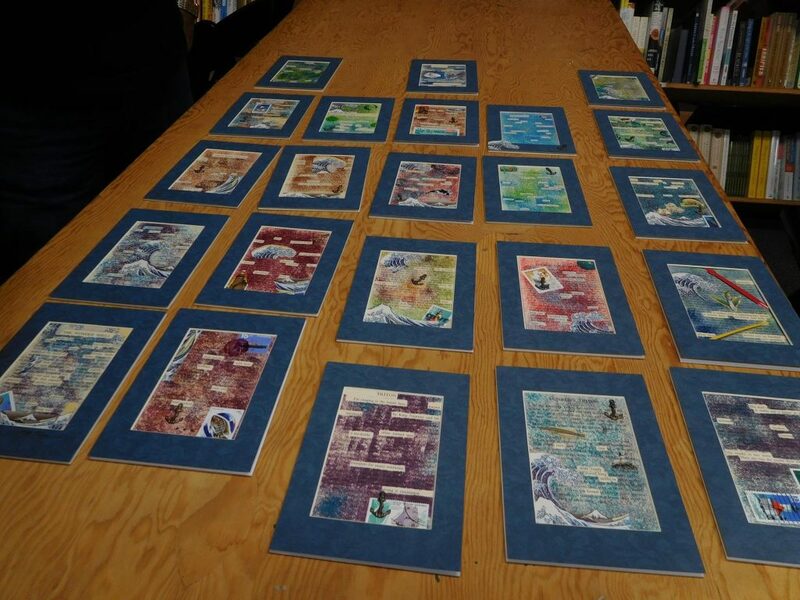 Attendees cut these images as desired, and then glued the backs with an Avery glue stick. Then they positioned these and pressed them to their piece, took a deli sheet of wax paper and covered it all, and rolled the whole thing with a wine cork to use as a brayer and make the surface smooth. Each “kit” also included a little brass anchor that I had antiqued beforehand. These were adhered with Aleene’s Fast Grab Tacky Glue. I was blown away by what everyone came up with! There was such positive energy in our crowded little space at the end of a long day, and seeing table-mates share their creations with each other made my heart full. She included the workshop in a blog post here. 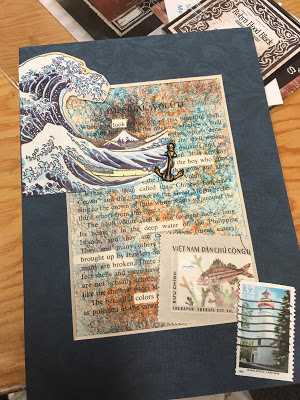 Several more folks also blogged about the weekend and included their Makerspace found poem pieces in posts.Click on the links below for their behind-the-scenes inspirations! Peg Cheng’s recap brims with passion. 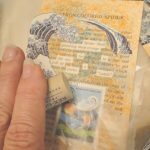 Elizabeth Steinglass found simple, lovely words with which to make magic, shared in her post here. Bridget Magee’s poem is fun and profound at the same time. Check it out here. Happy to make Jone MaCulloch‘s top 10 faves from the weekend, where she shares her poem about beauty! Holly Thompson, who came all the way from Japan, ended up with a card depicting a Japanese shell. How amazing is that? Here’s her post about the conference. 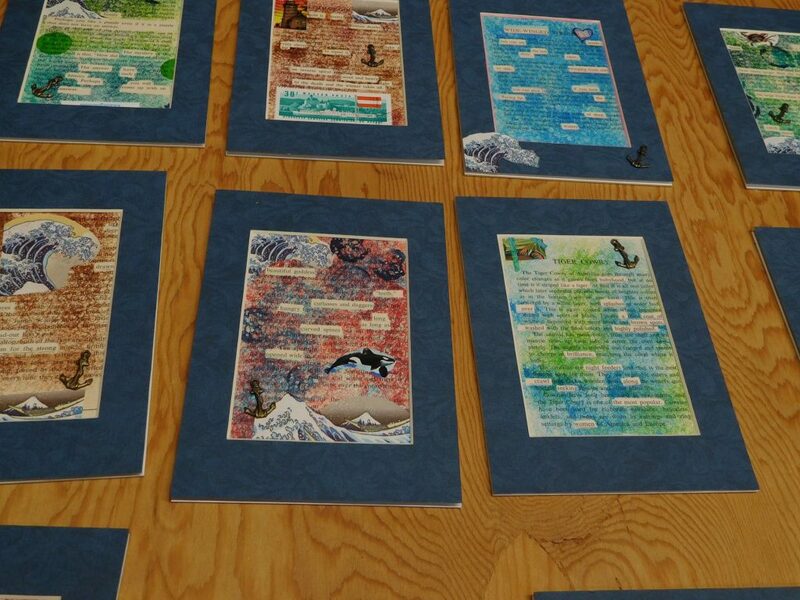 For a round-up of more poet blog links about POETRY CAMP, check out Sylvia Vardell’s wonderful post here. I love it when my writing life and art life collide – this was a magical opportunity, and I’ll cherish it always. 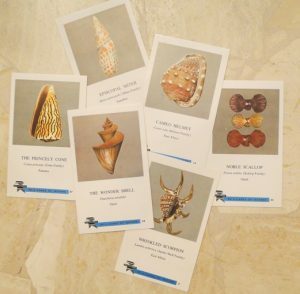 Thanks to everyone who participated so enthusiastically, and to Janet, Sylvia V., Sylvia T., and Nancy for inviting me to lead this creative found-poem treasure hunt! Thanks on all accounts, Buffy. And what a great memory you have! Yep, that’s his name… he was not thrilled about the hurricane name selection, though I guess, sadly, this name will now be retired. I tried to restrain myself from giving him too hard a time when we saw them during our evacuation week – I’m sure he had enough! Thanks for walking us wish-we-coulda-been-there folks through the process, Robyn. Such wonderful results! Hi, Michelle! Sure wish you could have joined us, too. Glad you enjoyed the peeks; I was/am awestruck at the variety of delightful pieces everyone created. It was a wonderful, inspired, poem-making night with you, my artistic friend! Thanks for giving us a glance at how to maybe do this amazing art on our own. I love all your vintage materials. I’d love to have you come work with my students. They’d love this! Oh what a night! Thanks for sharing your talent, your process, and your many hours preparing for this memorable event. Making art is making poetry is making art. Thanks so much, Nancy – LOVE that last sentence. :0) Thank you for the MANY (countless!) hours you and Sylvia T. devoted to making such a splendid conference! 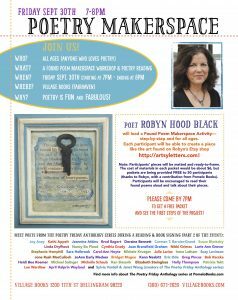 May I share your this post on our PoetryCHaT website, Robyn? I’d be honored – thanks! 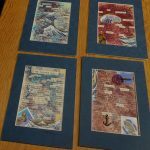 These are outstanding step-by-step directions for what was an OUTSTANDING found poem makerspace workshop–thanks again, Robyn! Janet, it was my pleasure – loved getting to do this! And you know all our berets and hats are off to you and Sylvia V. – what a very special weekend you helped create with the WWU team. Robyn, what a great post! It was wonderful meeting you at your Found Poetry Workshop at Village Books and then later seeing you again at Poetry Camp. My friend Brenda and I had the most amazing time getting to know Greg and Bob, and being surrounded by poets and writers making poetry and art together. You made the workshop so fun. It was truly MAGICAL. Glad your friends love your piece, too, and I’ll pass those kind regards on to Jeff – :0). I look forward to keeping up with you online, and hopefully in person again, too! I’ll join everyone else and say I wish I had been there, too! I love what I can see of all the end products–each one so very different! Thanks for coming by, Diane – I was blown away by the variety of finished pieces. With essentially the same types of “ingredients,” some of the found poems were whimsical & delightful, and others were more serious & moving. Personalities came shining through in all! Hi, Tabatha – it was a good bit of planning and effort, but the “results” were more magical than I could have imagined. And I do think I’ll keep that hubby of mine; I’ll pass along the kind words. Thanks! !